My fund chest is still partially filled and will continue to hunt for more great companies in the coming weeks. For now, I will focus on ARA Asset Management Ltd analysis and why I think that ARA fit the bill as one of the great companies. REITs, which include provision of fund management services to real estate investment trusts. Private real estate funds, which include provision of fund management services to private real estate funds and specialist equity funds. Real estate management services, which include provision of property management services and convention and exhibition services. Investment holding, which include investing in a portfolio of listed securities in REITs and a real estate fund manager. Management's Success” for more information on the company. 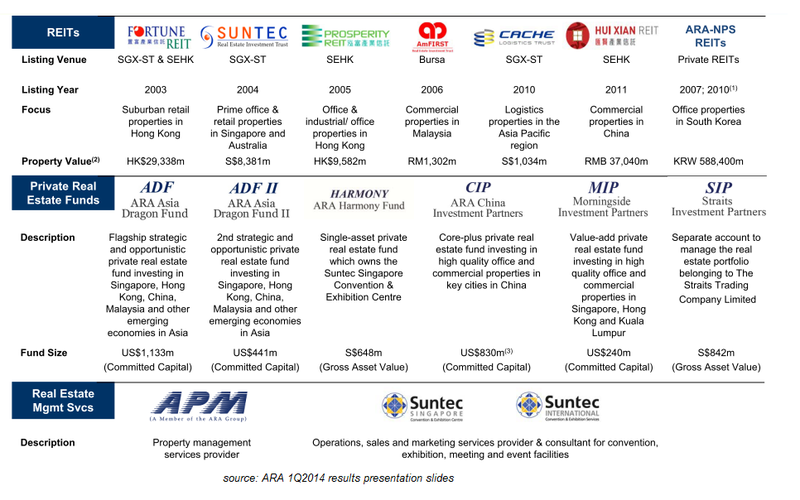 The above depicts ARA's business portfolio extracted from ARA Latest 1Q14 presentation results ending Mar 2014. It also includes a recent S$708.6 million acquisition of Macquarie Real Estate Korea Limited (renamed as ARA Korea Limited) in Apr 2014, a real estate management company based in Seoul. With the acquisition, ARA has two additional privately-held REITs in South Korea. ARA is owned mainly by CEO and founder, John Lim holding 19% stake and his strategic investor partners namely SGX listed Straits Trading Company and Hong Kong Cheung Kong Investment Company Limited with 20% and 8% stake respectively. Among institutional investors, Matthews International Capital Management LLC has the biggest ownership of ARA with a 10% stake in the company. Dividend Yield is very stable at ~5c for past five years. 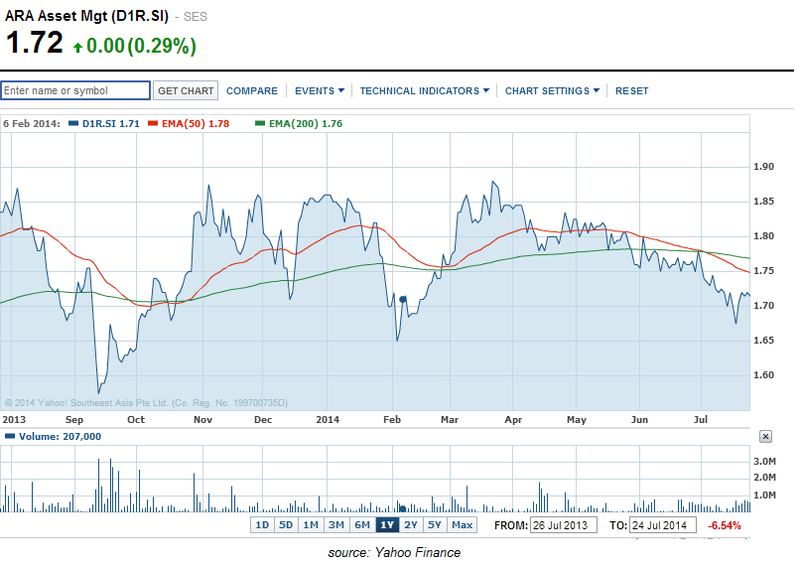 This translate to 2.9% yield at current price of 1.72. ARA has healthy cash and equiv of S$47.6mil. No net Debt, since cash exceeds total liabilities of 38.7mil. Total quarterly revenue increase by 18% to S$38.2mil yoy. Net Profit rise 6% to S$17.8mil yoy. Its recurrent management fees also increase by 11% yoy to S$29.7 mil. Net Profit grows steadily from 36.7mil in 2008 to 74.3mil in 2013. AUM rise from 11.7b in 2008 to 25.5b in 2013. “ARA is well-positioned to pursue further growth opportunities, as the combined partnership of Cheung Kong and Straits Trading, both well-reputed as premier business groups in Asia, will underpin our expanded business network reach in the Asia-Pacific region.” – John Lim CEO ARA. At a PE of 19 and PB of 5, ARA does not come cheap. Nevertheless I felt that it is a fair price considering ARA stellar growth over the last ten years and its excellent business model. I was enticed by its CEO ability to grow the business year after year, even in times of crisis - SARs and GFC. Furthermore, ARA has a multi-revenue generating business model that collects steady multiple streams of income from REITs, Property and Fund managements. Backed by Lee Ka-Shing Cheung Kong Holdings and one of Singapore oldest companies, Straits Trading Company, I envisage more growth in years to come even albeit the rising interest rate environment. Afterall, ARA has already expanded its regional network to span 14 cities in the Asia-Pacific, across Singapore, Hong Kong, China, Malaysia, Australia and South Korea within a short 10 years or so. If i remember correctly, ARA has now divested some stakes in their Reits such as Cache and others. How do you see their plans different from what they used to have in the past (through Reits dividends as cashflow)? Honestly I am not sure. Maybe the strategy is to have more partnership funds and later divest the funds to form Reits. Then ARA can manage and list the additional Reits to have more recurring/listing profits. I think ARA will continue to expand their portfolio in Asia, tapping CKH vast network of properties. My gut also assure me positive feelings of John Lim integrity, capability in managing the business and his vision to grow. To me, the strong leadership is sufficient to justify my buy, even without going into too much details! 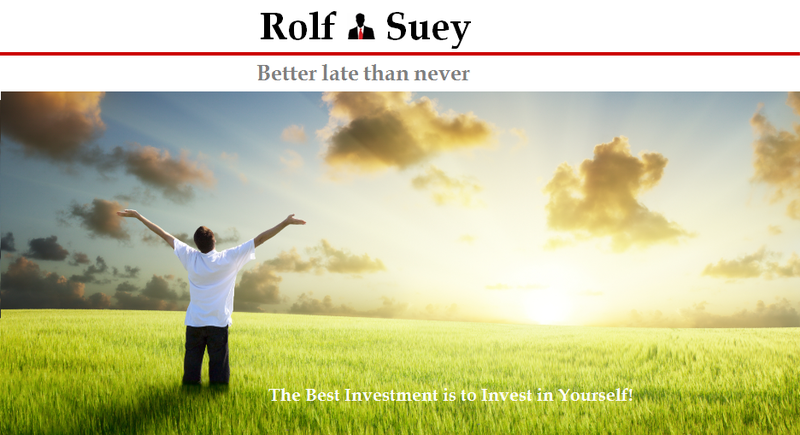 ARA is definitely long term stocks within my portfolio, unlike other stocks in my portfolio that is cyclical in nature which I am usually more careful and detail.